The foundation for Central Plains’ elite defense came from longtime former Little River coach Shane Cordell, who learned it in Oklahoma. Central Plains coach Chris Steiner still uses Cordell’s projector slides when he teaches the 3-2 look. Steiner is often asked about the 3-2 at coaching clinics, eight-man all-star games and when coaches call him for tips. Steiner tells everyone the Oilers “don’t look in the backfield.” Steiner doesn’t think people fully believe him. Steiner’s approach has yielded the best eight-man scoring defense in well over a decade. Central Plains has scored 576 points and permitted just 28 with nine shutouts. On Saturday, the Oilers (12-0) will play Solomon (11-1) in the Eight-Man, Division I state championship game at Newton’s Fischer Field. Start time is 3 p.m.
Central Plains last won the title in ’14, and Solomon, with a six-win improvement from last fall, is in a championship game for the first time in school history. “Our kids just do a really good job of staying disciplined,” Steiner said. Since 2006, the best eight-man scoring defense came in 2012 with Ness City. With coach Chris Bamberger, the Eagles went 13-0, won the Division I state title and permitted 71 points for 5.46 per game, according to Prep Power Index archives. Before then, the top defense was the 2003 Jetmore team that earned the Division I crown, finished 13-0 and permitted just 42 points for four points permitted a contest. Bamberger, now the Lakin coach, was a standout player on the defense. Current Wallace County coach Kevin Ayers led the Jetmore team that defeated Baileyville B&B in the championship, 42-6, the only points the squad allowed in the playoffs. Coach Steve Tiernan, currently Solomon’s coach, was B&B coach’s that year. Tiernan said Central Plains’ defense “has got to be up there” for the all-time best defenses he has seen. Tiernan has taken three squads to title games, a rarity, and won titles with B&B and Osborne. Last year, Solomon went through pronounced injury issues. This year, the Gorillas, with limited depth, have been much healthier. Solomon allowed 40.4 points a contest in 2017 and had permitted 14.5 this year. Solomon had previously reached sub-state in 2012 and ’15, Tiernan’s first season. “This year has just been really fun, for the fact to see the excitement in these kids’ eyes,” Tiernan said. In the last four games, the Gorillas have forced 17 turnovers, including five last week in a 28-12 win against Canton-Galva. 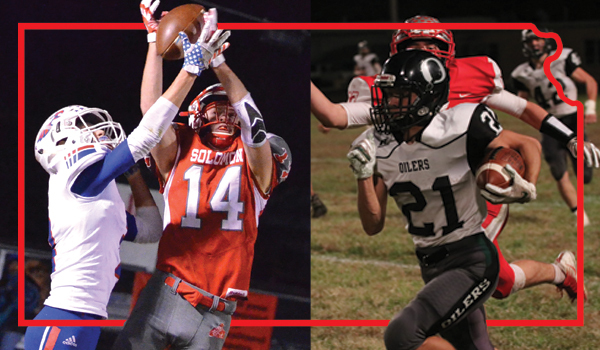 In district play, Solomon lost, 38-20, at Canton-Galva. Solomon has averaged 44.7 points a contest. “We did spread them out,” Tiernan said of the second Canton-Galva game. “Even up front, we just widened our splits, kind of spread those guys out where those defensive ends were out wider. Tiernan said the high turnover creation has come from putting defenses into long down-and-distance/passing situations and Solomon players focusing on their responsibilities. Solomon has forced 33 turnovers. “I am just going to do what I have got to do, and that’s worked,” he said. Senior linebacker Eli Basvic leads with 120 tackles, 25.5 for loss. Last year, Basvic had a heart condition and was taken off in ambulance during a game. Basvic’s heart rate wouldn’t go down, and he ended up having heart surgery. He did return in 2017 and finished with 37 tackles. Senior Jobe Fowles has 22 TFLs, while senior Logan Krause has delivered 18 TFLs. Senior Braden Neilson has intercepted nine passes, and senior Tyler Marfise has picked off five passes in a breakout season. Marfise is under 135 pounds. Offensively, Solomon moved Fowles from the offensive line to fullback. He has rushed for 767 yards and six TDs. Krause, a state qualifier in the track sprints last spring, has delivered 136 carries for 1,119 yards and 25 scores. He moved from defensive back to the line. Neilson is one of the state’s top eight-man quarterbacks. He has thrown for 894 career yards with a 16/5 TD/INT ratio. Neilson has rushed 152 times for 1,066 yards and 21 scores. For Central Plains, senior quarterback Myles Menges has completed 70 percent of his passes for 1,152 yards with a 23/4 TD/INT ratio. Senior Alex Hickel has 98 carries for 867 yards. He and junior Lawson Oeser have tied with 16 rushing scores. Defensively, the top-four tacklers are all seniors, the top-three are defensive linemen: Grant Heldstab, Mason Doll and Brett Liebl. Heldstab has 137 tackles, and 16 TFLs. Doll has 113 stops, 17 TFLs. Liebl has recorded 97 tackles with 18.5 sacks. Hickel has 88 stops. Steiner is very pleased with his unit on staying home on backside plays. Menges has picked off a team-high seven passes. Central Plains has forced 28 turnovers and is plus-20 in turnover margin. The two teams know each other well. Menges’ and Krause’s dads are friends. Steiner helps every year with the Solomon powerlifting meet. Claflin to Solomon is 76 miles apart, and the two have often been in the same district. From 2011-15, Central Plains went 5-0 against Solomon. That included a 56-52 win in 2012 and a 58-0 victory versus a banged up Gorilla squad in 2014. That year, Central Plains was considered the underdog in playoff games versus Spearville and Hanover, but pulled off victories by a combined 14 points. This week, Steiner has often evoked ’14. Central Plains is the favorite, and Solomon is the underdog. Steiner has been pleased with the preparation.